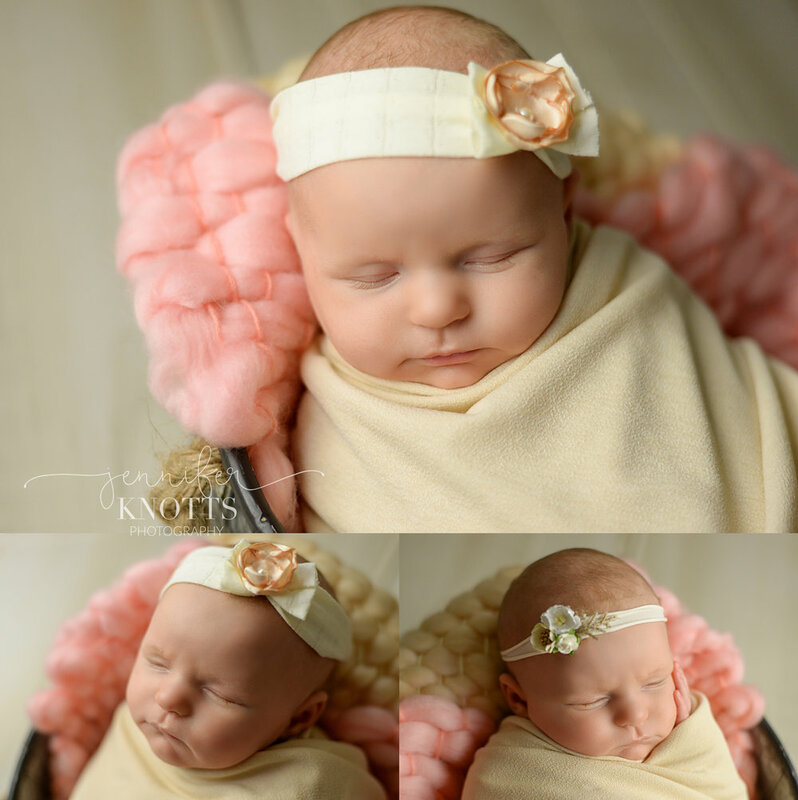 Miss Harper was such a beautiful, sweet girl for her newborn portraits! 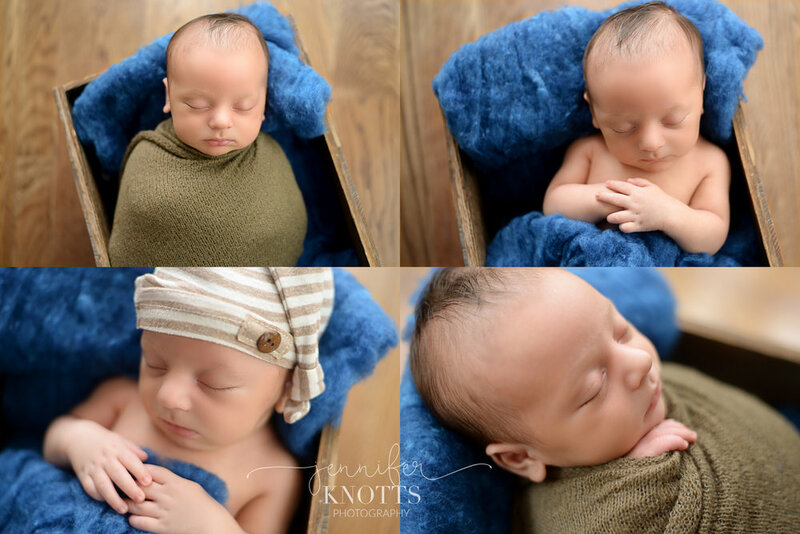 Typically, we like to schedule newborn sessions during the first two weeks of life, when babies are still very sleepy and can be safely posed in those adorable, curly positions. However, some parents become caught up in the busy first days of snuggling, feeding and changing. Harper’s mom contacted me, a bit worried that she was about a month outside of the typical age guidelines, but her baby girl was absolutely amazing! We did mostly wrapped poses to keep Harper nice and snuggled, stopping for quick snack breaks. We were also able to get a shot in a very special blue dress that has been handed down for many generations in her mama’s family. And although Harper is her parents first human baby, she does have two fur siblings, who cooperated for a family photo! 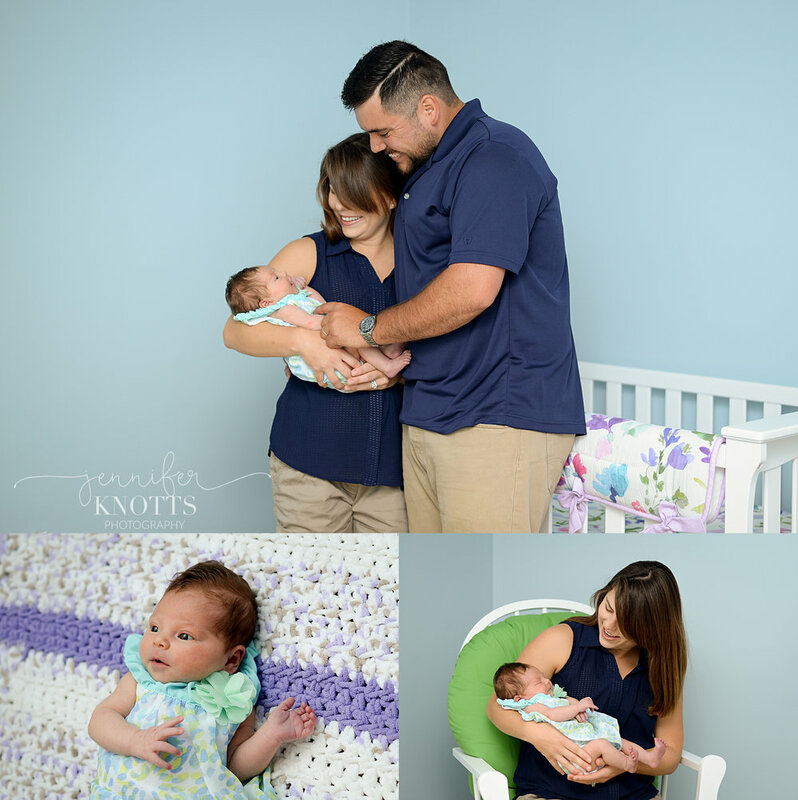 Click here to learn more about newborn session! 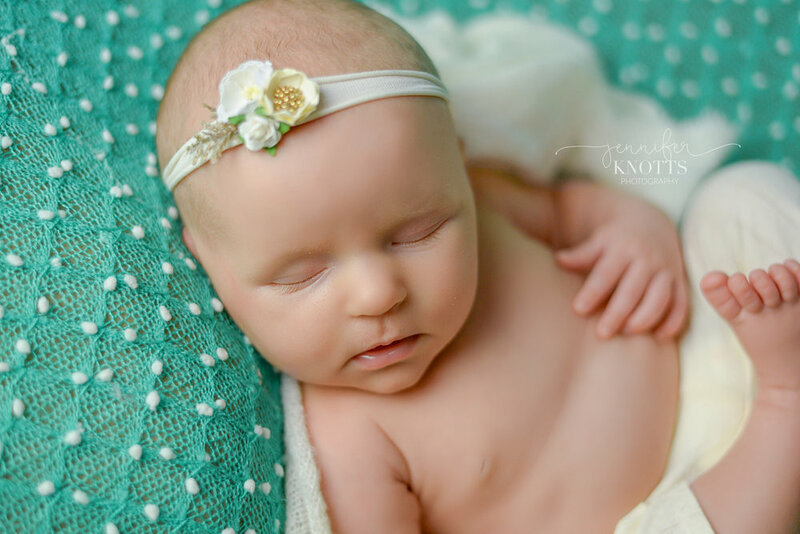 Baby Aubri was such an angel during her newborn session! Her mom wanted to incorporate all things girly, such as a color palette of pink and purple, as well as pearls. We even captured a few grins and adorable facial expressions while she was snuggled up in a bucket. We were able to safely include the family fur babies by taking several different shots and merging them together to create a precious final image. I have a feeling those pups will be by her side for a long time! We also had such a wonderful time creating some very sweet family images in the nursery and bedroom. I can tell Aubri will be a Daddy’s girl by the bond they seemed to already share. Mom and Dad were completely enamored by their new baby girl and it was such an honor to be a small part of their early days! Click here to learn more about newborn sessions! I’m betting that little man would make anyone’s baby fever go crazy! Theo was the most perfect baby, with his beautiful complexion and chubby cheeks. And he slept wonderfully throughout his newborn session! Theo’s mom requested neutral colors, so the palette for his portraits consisted of shades of tan, gray, and white, with pops of blue. He also has an adorable big sister, who was so proud of her new baby! Before setting up for the posed portion of the session, we created some relaxed family shots out on the gorgeous covered porch (I seriously NEED their swing!). I love the simplicity of a baby in just a diaper on a warm summer morning. 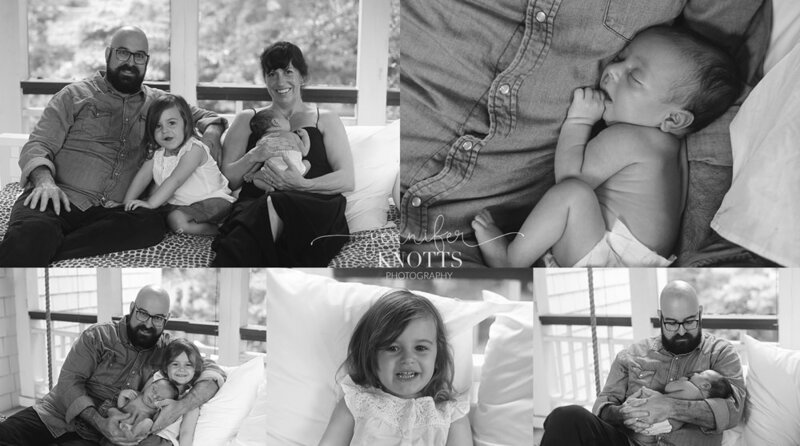 Here are some of my favorite images of Theo and his sweet family! 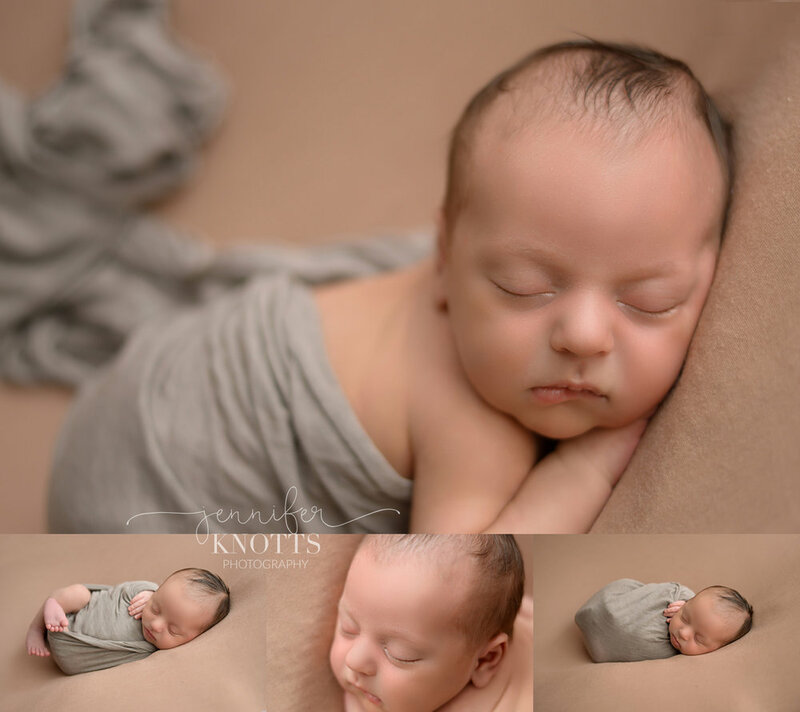 To learn more about newborn portrait sessions with Jennifer Knotts Photography, click here. So of course, in July, I started planning this year’s Christmas sessions. These 15 minute sessions will be for children only and include 5 digital images for $150 plus tax (additional images, print products, and holiday cards also available for purchase). They will be held in Leland on Saturday, November 3rd. If you book by October 1st, you’ll receive TWO extra digital images! Most importantly, we all know the devastation and destruction left in our area after Hurricane Florence. Schools are still closed, many people have lost their homes, and our region will be recovering for a long time. I’m so proud to have witnessed our community coming together in countless ways over the last week. After a bit of research, I’ve decided that 20% of proceeds from the Limited Edition Christmas Sessions will go directly to Brunswick Family Assistance, an organization helping to facilitate relief efforts in our community. To learn more and reserve your session time, click here! 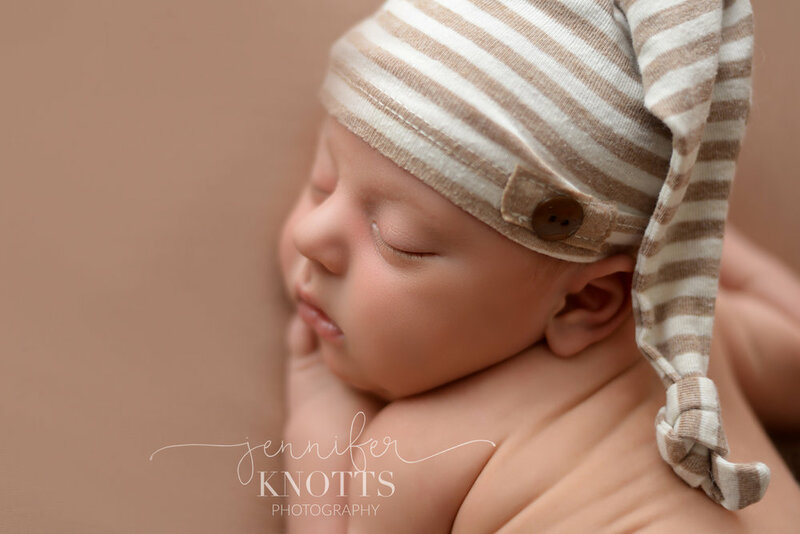 Located in the Wilmington, NC area, Jennifer Knotts Photography is a portrait artist specializing in posed newborn portraits, as well as older baby, toddler, and family photography. Jennifer serves southeastern North Carolina, including but not limited to Wilmington, Leland, Hampstead, Southport, Supply, and surrounding areas. In addition to indoor, studio style baby portraits, Jennifer also offers outdoor sessions in gorgeous locations around coastal NC.